Swarovski 2088 XIRIUS Rhinestones in SILK SHIMMER, a pale champagne rhinestone with the new Shimmer coating for extra sparkle. This lighter AB coating shows 3 shades of a single color more vibrantly and gives a softer more elegant look. Introducing the newest addition to SWAROVSKI CRYSTAL COLLECTION, the 2088 XIRIUS Rose Enhanced! The 2088 XIRIUS Rose Enhanced is designed for increased brilliance under performance or stage lighting. REVOLUTIONARY! 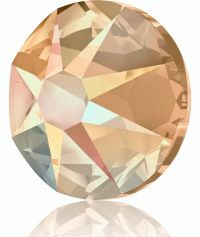 Representing a major leap forward in its tradition of innovation, XIRIUS is Swarovski’s most brilliant crystal yet. The beautifully intricate star cut, rich color, and enhanced foiling come together to produce unrivaled brilliance and an exceptionally durable new generation of crystal. Flat back rhinestones are the best choice for dance, figure skating dresses, costumes, leotards, cell phones, flip flops, clothing, western wear, greeting cards, scrapbooking, the possibilities are endless! Please see our FAQ section for tips and application information. Flat back rhinestones are very easy to glue on but can also be set with tiffany or rim settings. VERY IMPORTANT: Please remember to order enough stones for your project as dye lots can very. This is extremely common with the Special Effect stones such as Fire Opal, Volcano, Vitrail Medium, Heliotrope, etc. Swarovski 2088 Rhinestones stone colors are very consistent but slight variations can occur with different production lots.